Team I’d like to share with you an absolutely tremendous media hit from Asia where Loren was just featured on the cover of Elle Taiwan. I love that her interview will not only inspire new people to chase their entrepreneurial dreams but will also ultimately help more people discover the power of SHOP.COM and Market America. This is an absolutely huge publication with a massive following, so this type of exposure and media coverage can really go a long way, especially when UFOs share this themselves. It’s a great way to spark a conversation about your business – and the timing couldn’t be better with the 2018 Market Taiwan Leadership School going on right now! Congratulations to my incredible wife Loren for this amazing feature, the inspirational story, and the utterly stunning photoshoot. She’s the perfect mix of brains and beauty and I consider myself so lucky to call this cover girl the love of my life!! I’ve included below the English translation from Loren’s Elle feature so you can read it for yourself! Loren Ridinger’s Motives®cosmetics brandempowers women with the confidence to find their strengths as it reveals their true beauty inside and out. Written by June Howell. Photographs by Troy Wang. Style by Jazmin Gonzalez. 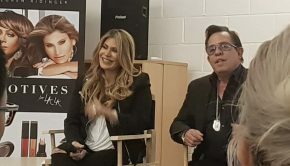 It was a beautiful sunny day in Manhattan, N.Y. when the ELLEteam met with Loren Ridinger, creator of the iconic Motives brand of cosmetics, to learn about the life of this internet mogul. Stepping into Loren’s house, we were greeted by an all-white décor set off by a large volume of Chanel photographs. An attractive hallway and living room feature contemporary paintings and more photographs, with an emphasis on the beauty and allure of women. Floor-to-ceiling windows adorn the house and afford a panoramic view of the Hudson River and the Statue of Liberty rising from New York Harbor. As we walked toward Loren’s study we noticed shelves filled with her Motives cosmetics, and a visitor is touched to find a display of numerous photos showing Loren with her beloved family and friends. These are clearly the centerpiece of her life. And we were thrilled to see some ELLETaiwan magazines, too! Down a spiral staircase we came to Loren’s bedroom. It is full of fashionable clothes and shoes; it’s easy to see that Loren is a passionate fashion icon. As we admired her style, Loren’s husband, Market America Founder, Chairman and CEO JR Ridinger, entered the room. Dressed casually, he warmly greeted his guests from Taiwan. I finally came into another bedroom where Loren was doing her makeup, preparing for her feature cover photo. I was a bit nervous, but she greeted me with such warm enthusiasm that I soon felt as if I was an old friend she had not seen for a while. As we began to talk she told me how much she loves Taiwan, the people there — and how much she loves ELLE! Her passion shone through as we began our day of photographing and interviewing Loren in wonderful New York City. I watched the makeup artist use the Motives Bloom Palette to create gorgeous smokey eyes for Loren. “For today’s ELLECover shoot, all the cosmetics we are using are Motives,” she said with a smile. Why did Loren, the Senior Executive Vice President of Market America, decide to create her Motives brand? “When I was a little girl, every night I watched my mom putting on makeup before my dad came home. She would put on beautiful eyeliner and mascara,” Loren said. ”I wondered why my mom spent so much time on her makeup for my dad. Later, I understood that makeup didn’t just make her look beautiful, but also made her feel beautiful inside, and feel confident!” That life lesson from her mom planted a seed in the heart of Loren that later grew to inspire the creation of her Motives brand. The other driving force behind Motives came from Loren’s soul mate, JR. Seeing her passion, he encouraged her to start her own line of cosmetics that would be affordable — and empowering — for all women. Loren agreed. “For me, Motives means being a strong woman,” she said. “It is more than the cosmetics themselves. I hope women will understand that makeup is not only about how you look, but also about a deeper meaning in the heart. It’s like how my mother felt more confident when she greeted my father at home. She was so beautiful, and my father was so handsome. It made them feel like they were at their wedding again. It was all so beautiful.” Bestowing women with the means for inner confidence along with outer beauty is what drives Loren to keep moving forward. “We are raised in the belief that men control everything,” Loren said. “If you are able to have a bunch of kids, a house, dogs, you have a wonderful life. But I believe women can follow their dreams and create their own career at the same time they have a happy family.” Loren shared that many women say there is no time for them to realize their dreams because they are busy taking care of the children and their husband. They feel stuck amid the rocks of life, unable to move and change — they’re trapped! How can they change this? “You prioritize your life and start focusing on the most important things,” she said. This defines Loren’s mission. Every time she gives a speech about Motives, she inspires and encourages women to use their time well to break the status quo. The thing she wants to do the most is to empower people to act and to make their dreams come true. Many women envy Loren, thinking she married a wealthy husband. But the truth is that when JR and Loren began Market America they had nothing. She recalled that she met JR when she was in her first year of college. They fell madly in love. “We had no money. JR could not even afford a nice dinner,” Loren remembered with a laugh. “We went on dates at fast food restaurants like Wendy’s, McDonald’s. But he kept telling me, ‘One day, we will succeed. One day, I will take you to the fanciest restaurants. One day, we will have everything we’ve ever dreamed of.’” That was hard for Loren to grasp at a time when there was no money and her mom supported them by bringing them macaroni and cheese — along with a lot of love. Everyone questioned them: How could they make their dreams come true without any financial support? “We had and still have passion and belief,” Loren stated firmly. “The power of belief is greater than that of moneyWe believed that one day we would have the best products in the world. We would have our own sales channel. JR saw that the future of shopping was online, and we knew we would be able to choose the best products for people to buy from their homes.Now it has been 26 years and this is what we are doing as the best online shopping site in the world! Loren and JR encouraged and inspired each other every day. To help maintain their passion and enthusiasm, for example, they created dream boards that helped them visualize their goals, checking them three times a day. Some people thought it was silly. JR and Loren knew it was part of a winning strategy for success. Loren’s initiative is to empower women. In our culture, it is acceptable for girls’ childhood dreams to be undervalued or overlooked, to have dreams that are small and their goals set lower than their male counterparts. For example, if it is a girl’s dream to be a doctor, she may be encouraged to simply be a nurse, or a stewardess rather than a pilot. Because of its quality products and strong social media presence, Motives has changed and empowered the lives of many women. Loren recalled that one of the most remarkable testimonies she received was from a woman in the U.S. state of Arizona. For 17 years, she suffered daily from domestic abuse. Finally, she decided to end her marriage and moved into a shelter. She started a career with Motives and now she earns up to US$5,000.00 per month, which is the most money she has earned in her life. She left her violent marriage and rebuilt her confidence. She has also been able to help women who have suffered the same thing regain their freedom. There are countless stories like this. These women not only earn a living financially, but more importantly, they earn a lifestyle that is built on their terms. For Loren, the best part of Motives is its ability to give women the opportunity of a successful career; join an international group of like-minded people; and learn, with entrepreneurs all over the world, to control their time and finances. It is really wonderful! She went to a hospital again for a thorough exam that found there was indeed something bad in her brain, and she needed surgery. However, there was no doctor who was willing to do surgery for her because they felt it was too dangerous. But she finally found a doctor in New York who was willing to do the operation. The doctor told Loren that he could not do the brain surgery directly. Instead, the doctor advised it should start from her leg. Loren remembers that before the surgery, the doctor told her that it is very dangerous, and she might not recover; if she did, she may not remember her child and husband. On the morning of the operation, Loren did not want to see her family cry. She wanted everything to “go now!” and did not want to give herself time for hesitation. She recalls saying that morning that “fear will not change anything. I told JR, ‘I hope you will give me a hug and tell me you can’t wait to see me.’” The operation was successful; everything turned out to be OK. When I heard this story, I could not help saying to Loren, “JR is really lucky to have married you! You are so strong!” There’s a saying that there’s a woman behind every successful man. But Loren does not stand behind JR: She walks with him side by side through the highs and lows of their career and life. She demonstrates great vitality, living the spirit of Motives and bringing women plentiful spiritual strength! Wow! Such a powerful story. If someone asked me, “Tell us about Loren’s heart.” I would say, read this. Really touched by our so pretty, so smart and so caring leader. Fast becoming so famous. 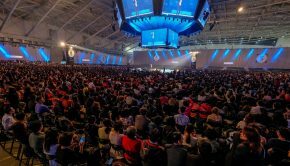 JR founded Market America in 1992 and is the architect of the UnFranchise Business Development System—a business model that currently rewards more than 180,000 hardworking, independent business owners, more than 300 of whom have become millionaires. In a time of economic uncertainty, JR has leveraged Market America and SHOP.COM into a recession-proof business by offering in-demand, market-driven products through the company’s exclusive lines and millions of other items via the company’s online partner stores. Built on product, powered by people, he has created the ultimate online shopping destination where customers get paid to shop.